Have you heard the awkward outtakes from Orson Welles radio spot for frozen peas? Lee Hayden could relate to them. He too must record multiple takes of a lame radio commercial, but at least barbecue sauce better fits the faded cowboy movie star’s image. His career is on life-support, but he experiences an unlikely surge of interest at an inopportune moment in Brett Haley’s The Hero, which screens during the 2017 Sundance Film Festival. Hayden is best known for playing the titular gunslinger in an early 1980s hit called The Hero. Since then, he has become as western icon for his drawling voice and silver moustache. In fact, he will soon receive the Western Icon Award to prove it. Hayden’s only friend is his drug dealer Jeremy, a former actor with whom he worked on a short-lived television show. While struggling to decide whether he wants to do anything about a recent diagnosis of pancreatic cancer, Hayden happens to make the acquaintance of Charlotte, one of Jeremy’s other customers. This is not exactly a meet-cute, but Hayden is too old for that sort of thing anyway. Regardless, they seem to enjoy each other’s company, especially when they both arrive at the Western Icon Awards slightly stoned. That turns into Hayden’s best career move in years when his idiosyncratic acceptance speech goes viral. However, issues with his resentful grown daughter and the looming cancer might overshadow his sudden internet fame. Beat for beat and note for note, Haley’s screenplay might be the most predictable, script-by-numbers narrative you will ever forgive. This is the sort of film that is all about the performances—and they are genuinely awards-caliber. 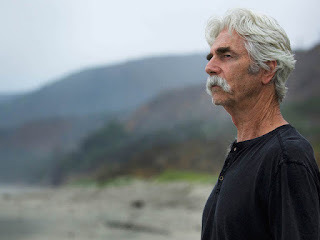 Sam Elliott truly embodies Lee Hayden. He has the grizzled look and laconic drawl, but he invests the character with enormous dignity, while simultaneously exposing all his regret and self-loathing. It is still January, but there is a good chance Elliott will be in awards contention for his turn in/as The Hero. However, maybe the greater surprise is how terrific Laura Prepon is portraying Charlotte. She is a smart, sultry, sarcastic presence, who truly lights up the screen. Nick Offerman’s Jeremy is also amusing in a lowkey kind of way. You could almost say he gets to play the film’s Sam Elliott character. If Haley had deviated from the formula a bit more, The Hero might have become a Western Icon in its own right. Instead, we have what we have—and it is still well worth seeing, thanks to the stellar work of Elliott and Prepon (plus Offerman’s rock solid support). Despite the obvious manipulation, the emotional payoff is hugely satisfying. Recommended for nostalgic fans of Elliott and the western genre, The Hero screens again today (1/23), Thursday (1/26), and Saturday (1/28) in Park City, as part of this year’s Sundance.